World Athletics Final Is Satuday & Sunday!!! The meet is loaded and is the final blowout to a fantastic 2008. 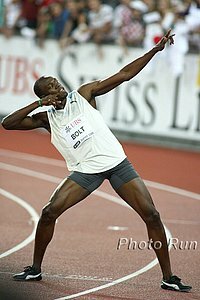 *Usain Bolt Names His Victory Dances And States He's Looking Forward To Big-Time Challenge From Tyson Gay and Asafa Powell in 2009 Bolt: "My body (language) is just a gesture to the world. It's a thing we do in Jamaica. It's actually a dance, but I just took it and turned it into my move. After the 100m I did a dance called The Sweep and after the 200m I did one called The Gutty Cooper."